June 9, 2017 By Tina M 4 Comments This post may contain affiliate links. Read my disclosure policy here. After several days in paradise, we are finally back from our Hawaii vacation to share with you some free things to do in Oahu Hawaii. One of my favorite things about Hawaii is that you can make it whatever kind of vacation you want! There are so many free things to do in Oahu Hawaii (as well as the other islands), that you can make your vacation as cheap or fancy as you’d like! This list includes free things to do in Oahu, but it ALSO includes several CHEAP things to do in Oahu ($10 or less per person). 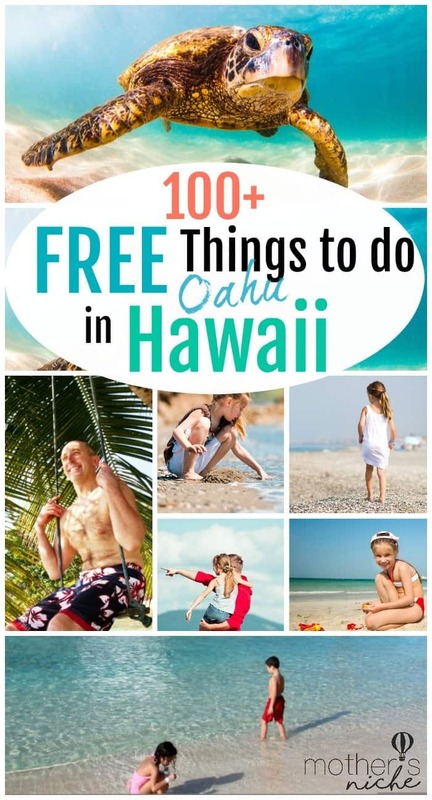 There were several cheap things worth mentioning, so I’ve made it easy for your to see which things are FREE to do in Oahu, and which are Cheap (Look for the *** sign next to each activity.) If there is an *asterisk* symbol, it means that activity is in the $10 or less category. I got in contact with gohawaii for many of these ideas before we left on our trip, and then added a few of my own after we got back! If plan on snorkeling (one of the BEST free activities to do in Hawaii) I HIGHLY recommend full-face snorkel masks. They are AMAZING and they make snorkeling so much easier because you don’t have to worry about anything and you just breathe how you normally would in real life. Plus, there’s a cool feature in the snorkel top that keeps water from coming in if you go further under water, or if a wave comes in. We didn’t buy anti-fog spray and they worked wonderfully without it. We all came home and agreed it was the best-spent money of the whole trip. After researching different brands for hours, we finally decided on this one which was cheaper than competing brands anyway, and worked flawlessly for us. My husband and I both wore size M/L. If you can, stay on North Shore. This will make all the difference for the kind of vacation you have! Those who tell me Oahu wasn’t their favorite, are always those who stayed in the city and didn’t appreciate the crowded feel and busy nature. North shore is beautiful and so relaxing! These are the best North Shore hotels, we chose the Courtyard Marriott North Shore after reading lots of reviews and LOVED the choice we made! It shared a parking lot with the Polynesian Cultural Center, so we were able to walk to the food trucks in the morning for breakfast, and the famous Hukilau Cafe is just around the corner (featured on 50 First Dates)! A lot of our favorite things to do in Oahu are on North Shore, so don’t ever feel like there won’t be enough to do, it spans a large area of the island. If you want to do some fun activities, but keep things as cheaply as possible, I highly recommend the Go Oahu Card. You get 34 attractions included for one price, and if you choose the 3-day card it includes the Premium attractions (Polynesian Cultural Center, Sunset Dinner Sail, Dolphin Encounter, etc.). The Polynesian Cultural Center alone is worth getting the pass. It was our very favorite activity experience on Oahu, and their evening show is spectacular! Read more about what’s included on the Go Oahu Card. You can also check Hawaii Living Social for deals on certain activities or restaurants. Discover the energizing sights, sounds, art, culture, history, nature, and adventure of the island of Oahu without having to unload your wallet! 1. Enjoy one of more than 100 festivals and events throughout the year that celebrate culture, community, music, and art, such as the Okinawan Festival, Chinese New Year lion dances, Lantern Floating Hawaii, Waikiki SPAM® Jam, and the Ukulele Festival, just to name a few. 2. Visit the Hawaii State Art Museum (HiSAM), one of the few state-sponsored art museums in the country, and view the finest collection of works from Hawaii’s best artists. 3. Learn about the history of Waikiki on the Waikiki Historic Trail walking tour. 4. Visit the Hyatt Regency Waikiki Resort & Spa on any Friday to experience its weekly “Aloha Friday” Polynesian show featuring hula dancers, lei making, fire knife dancers and music. 5. Discover the history of surfing through photos and memorabilia on the walls of Duke’s Waikiki at Outrigger Waikiki on the Beach. 6. Sit in on a Sunday service conducted in the Hawaiian language at Kawaiahao Church. 8. Attend one of the many arts and craft fairs held at Thomas Square, Kapiolani Park and Ala Moana Beach Park. 9. Witness the culture and beauty of the islands as you watch a traditional torch lighting and hula performance on Waikiki Beach near the Duke Kahanamoku statue at sunset. 11. Stop in at the lei stands that line Maunakea Street in Honolulu’s Chinatown and see firsthand how these intricate lei are created. 14. Learn about Princess Kaiulani, Hawaii’s last and most beloved Princess, on Thursday mornings at the Sheraton Princess Kaiulani Hotel. 15. Take a scenic drive over the Pali Highway stopping at the historic site with panoramic views at the Nuuanu Pali Lookout. 16. Surf through photos and memorabilia on the walls of Duke’s Canoe Club at Outrigger Waikiki on the Beach. 21. Visit the World War II Valor in the Pacific National Monument, a monument built to honor the men who died on the USS Arizona the day before World War II began. 24. Learn how to make traditional Hawaiian quilts and lei using fresh tropical flowers at the Royal Hawaiian Center. 25. Visit the Spalding House on the first Wednesday and third Sunday of every month for free admission. 26. Visit the Honolulu Museum of Art on the first Wednesday and third Sunday of every month for free admission. 27. Honor soldiers from the Spanish American War to the Vietnam War at the National Memorial Cemetery of the Pacific, formerly known as Punchbowl. 28. Learn about the history of pineapple in Hawaii through the multimedia “James Dole Story” at Dole Cannery Square. 29. Ascend to the 10th floor observation deck of the Aloha Tower, Honolulu Harbor’s famous clock tower, which at one time was the tallest building in Honolulu. 32. Visit Fort DeRussy Beach where in addition to picnic tables, volleyball courts and excellent surf, you’ll find the U.S. Army Museum of Hawaii. 33. On the first Friday of every month, art galleries in downtown Honolulu open their doors from 5-9 p.m. at no charge. This event is wildly popular with art enthusiasts of all ages. 34. Find inner peace at the Byodo-In Temple, which houses a 900-foot Lotus Buddha. Be sure to ring the Peace Bell before entering the temple for happiness and longevity. 36. Take ukulele or hula lessons at the Royal Hawaiian Center. 37. Volunteer at Paepae o Heeia, an ancient fishpond located on the Windward side of Oahu that hosts a monthly volunteer day on the 2nd and 4th Saturdays of most months during the year. 38. Visit King Kamehameha’s statue in front of Aliiolani Hale and on King Kamehameha Day, celebrate the King’s legacy by attending the Lei Draping Ceremony. 39. At the end of April relax on the Civic Ground by Honolulu Hale in historic Downtown Honolulu and join the Hawaii Book & Music Festival, a celebration of books, storytelling and music. 42. Head to Hoomaluhia Botanical Garden for catch-and-release fishing every weekend. 43. Race through the “World’s Largest Maze” at Dole Plantation and enjoy its signature Dole Whip on the way to the North Shore. 44. Keep your eyes open for humpback whales off Makapuu on Oahu’s southeast shore or Kaena Point on the northwest side of the island from November through April. 46. Hike to Manoa Falls beneath the canopy of the tropical rainforest. 47. Count the waterfalls along Highway 3 (H-3) after a beautiful refreshing rain. 48. In the summer, snorkel at Shark’s Cove on the North Shore, a marine conservation zone with a cove filled with fish, coral formations and lava caves. This can be a great place to spot turtules, and to the left of the cove is a big tide pool that kids can splash around in! This was one of our favorite free things to do in Oahu, but make sure you wear some water shoes since it’s rocky. 49. If you visit Shark’s cove, then you need to visit the remnants of a nearby Hawaiian temple that also has a spectacular view! It’s called Pu’u o Mahuka Haiau and it’s about 1/2 mile up Pupukea Road (Road next to the Foodland). 50. Sit under a tree at Kakaako Waterfront Park and watch the ships and surfers go by or roll down the hill with childlike abandon. 52. Hike up to the Makapuu lighthouse passing Madame Pele’s chair and following the dramatic cliff-lined coast. 53. Drive to the windward side of the island to the charming beach towns to discover why the soft, white sand beaches here make the list for the world’s best beaches over and over again. 54. Enjoy the Honolulu Zoo’s Wildest Show in Town summer concert series held weekly from June through August. 56. Wear reef shoes and in low tide walk to Goat Island in Laie to explore the tide pools teeming with life. 57. Hike the Maunawili Trail on the Pali Trail or one of many other well-marked trails throughout Oahu. 58. Pick hibiscus and plumeria along the side of the road and wear them in your hair. 59. Learn to standup paddleboard with legendary surfer, China Uemura, at Ala Moana Beach Park. 60. Enjoy views from Magic Island of boats and outrigger canoes with Diamond Head and Waikiki as the backdrop. 61. Build sandcastles for fun family competition or watch student designers compete in the University of Hawaii at Manoa School of Architecture’s annual sandcastle building contest in February. 62. View world-class surfing competitions at Banzai Pipeline, Sunset Beach or Waimea Bay on the North Shore. 63. Watch the sunset from high atop Tantalus as Honolulu city lights begin to twinkle in the dusk. 64. Feel the sea spray from the blast of the Halona Blowhole, just around the bend from Sandy Beach. 65. Visit the Hilton Hawaiian Village Waikiki Beach Resort to see its menagerie of exotic birds, fish and turtles located throughout the resort. 66. Take a walk along the beach at sunrise and see the ocean come to life with early morning surfers and swimmers. 67. See the daredevil hang gliders make their way off Makapuu Point. 68. Trek up to the summit of Koko Head at sunset for sweeping views of the South Shore. 69. Keep your eyes and ears out for Hawaii’s colorful birds in Kapiolani Park, Moanalua Gardens and other parks throughout the island of Oahu. 70. Watch the sunset from Mokuleia on the North Shore. 71. Hike above the leeward side along the Aiea Heights Loop Trail overlooking Pearl Harbor. 72. Spend a day at Waimanalo Beach, named the top beach in the U.S. for 2015 by Dr. Beach. 73. Find the four Wizard Stones on Waikiki Beach and learn about the legend behind them. 74. Learn about Hawaii’s culture while listening to popular local musicians as part of Waikiki Beach Walk’s Hawaiian music concert series, Na Mele No Na Pua, “Music for the Generations.” Embassy Suites hosts the concert series, as well as a permanent, extensive exhibit showcasing Hawaii’s rich music history. 75. Experience and meet Hawaii’s local fishermen at the early morning Honolulu Fish Auction at Kewalo Basin, where the fresh catch is displayed and auctioned off to the island’s chefs and merchants daily at 5:00 a.m.
76. Listen to the Royal Hawaiian Band at Iolani Palace on Fridays from 12-1 p.m. and at Kapiolani Park on Sundays from 2-3 p.m. 77. Relax harbor side at Aloha Tower Marketplace and listen to the island’s most popular entertainers at waterfront stages at Gordon Biersch as boats, barges and cruise ships float past. 78. Picnic at Kapiolani Park in Waikiki. Then stroll through the park and see all of the activities from soccer games to craft fairs to live entertainment. 79. Stop by Ala Moana Center’s Centerstage, the hub for more than 500 performances annually, from keiki (children) hula to rock, chorale music and street dancing. 80. Enjoy the colorful parades that float down the streets of downtown Honolulu and Waikiki during the Aloha Festival, King Kamehameha Celebration, Honolulu Festival, and Chinese New Year celebrations. 81. Enjoy “Sunset on the Beach” at Queen’s surf in beautiful Waikiki, where the sandy shore is transformed into and outdoor movie theater, with live music, food booths, and free Hollywood movies. You might even catch some people playing beach volleyball. 82. Listen to Hawaii’s best local entertainers performing in the hotels and on the streets of Waikiki. 83. Take a self-guided tour through Manoa, Kapahulu and Kaimuki, some of Honolulu’s oldest and most charming neighborhoods. 84. Experience a bit of Polynesia at one of the free performances by the Polynesian Cultural Center at the Royal Hawaiian Center. 85. Daring designs and edgy colors have taken over the window displays on every corner of Chinatown. Explore the many locally-owned boutiques and unique eats that have popped up in this otherwise traditionally Chinese area of Honolulu. 86. Take a guided factory tour of the Kamaka Ukulele, one of Hawaii’s finest ukulele makers. Learn the history of the Kamaka Family and their dedication to building skillfully-handcrafted ukuleles for nearly a century. 87. Watch top local, national and international athletes compete in any of the dozens of sporting events such as the Tin Man Biathlon, Waikiki Roughwater Swim, Duke’s OceanFest, and Honolulu Marathon. 88. Visit Ward Warehouse for free hula lessons on Thursdays and country line dance classes on Tuesdays. While there, check out Ward Centers’ great locally-owned boutiques for special and affordable Hawaii souvenirs. 90. Learn more about Hawaii’s melting pot of cultures at any of the Chinese, Okinawan, Japanese, Filipino, Portuguese, Greek, and Korean festivals held throughout the year. 91. During the weekend, view the work of local artisans at the Art on the Zoo Fence along the fence of the Honolulu Zoo. 92. Admire the architecture and say a prayer at any of Honolulu’s many spectacular churches: St. Andrews Cathedral, Central Union, St. Clements, and Lutheran Church of Honolulu. 93. Watch in awe as fireworks explode into beautiful colors on Friday evenings on the beach fronting the Hilton Hawaiian Village Waikiki Beach Resort. 94. Drive to the North Shore for Matsumoto’s famous shave ice, a juicy Kua Aina hamburger and garlic shrimp from a roadside shrimp truck. * This was another one of our favorite things to do in Oahu. 95. Dedicate and float a paper lantern for a special cause or in memory of a loved one at the Lantern Floating Hawaii Ceremony, held every Memorial Day at Ala Moana Beach Park. 96. Browse the booths at the Aloha Stadium Swap Meet for affordable made-in-Hawaii souvenirs. The Swap Meet hours are Wednesdays and Saturdays, from 8 a.m. – 3 p.m., and Sundays from 6:30 a.m. – 3 p.m. The Marketplace hours are Wednesdays, Saturdays and Sundays from 8 a.m. – 3 p.m.
97. Enjoy locally-grown produce and meats, fragrant flowers and tasty treats at the Kapiolani Community College Farmers’ Market on Saturday mornings. 99. Design your own colorful kite, then let it soar in the breezy winds at Sandy Beach Park. 100. Head to Ala Moana Beach Park to find a spot to picnic while enjoying the sunset. 101. During the holidays, head down to Honolulu Hale to view the Honolulu City Lights. The month-long celebration kicks off with the Electric Light Parade and annual lighting of the City Christmas Tree. 103. Catch some free Waikiki Fireworks from the Hilton Hawaiian Village. They put on a free firework show on Waikiki Beach after their polynesian show every Friday. The fireworks show usually begins at 7:45pm and lasts about ten minutes. What are some of YOUR favorite free things to do in Oahu? Mahalo for the nice long and informative list of Free things to do 🙂 Aloha! Thank you for the information, Tina! My fiancé and I are heading to Oahu for our honeymoon in October. I have a couple of questions for you if there’s a way I can contact you. Thank you for your time and praying for your struggles. Thank you for all of the wonderful information! Your link to the full-face snorkel masks does not work. Any brand that you used that you would recommend?